Judging by those observations, Uruguay seems to enjoy a strong, positive reputation – especially as destination. But what about its potential to attract investors and talent? How does this comparatively small country – a dwarf in comparison with neighboring countries Brazil and Argentina – attract and retain talent, and which areas does it consider of particular strategic importance? Why live, work or invest in Uruguay? How does Uruguay build and promote its country brand internationally? Uruguay: how environmentally friendly, sustainable? If interested in Uruguay, we recommend you bookmark this page, since we will add more interviews and information over the next weeks. Uruguay is a well-known destination in South America, especially loved by Argentinian and Brazilian visitors during summer months, but also increasingly popular among Europeans. Among Uruguay’s highlights as destination are José Ignacio and Cabo Polonio, also the town of Colonia del Sacramento with its historical charm. Apart from cultural and beach experiences, the country’s many vineyards – anything from the glamorous Bodega Garzón to small, family-run enterprises – invite you to enjoy Uruguay’s wines, perhaps together with an infamous asado (Uruguayans, like most South Americans, love their meat). And of course Montevideo, the capital, where we recommend to take a stroll (or run) along the Rambla (coastal boulevard), to visit Mercado Ferrando, and to spend some time at Escaramuza Libros. While there, you’ll also want to see Plaza Independencia, the heart of old town, from where the pedestrianised Peatonal Sarandí will lead you to the Cathedral and the Cabildo – former seat of government and now a museum of city history. The popular Mercado del Puerto is just a stone’s throw from here. Getting in and out of Uruguay is easy – by air through the modern airport, or by ferry to Buenos Aires (fast ferry service takes around 2 hours 15 minutes). Uruguay might be a little more expensive as destination but feels more relaxed and more secure compared to neighbouring Brazil or Argentina. More about Destination Uruguay here (a website full of inspiration for places to visit and explore). Why work and invest in Uruguay? As one of the most advanced and politically stable countries in the region, Uruguay is also a popular place for a growing number of internationals to live and invest in. PuntaTech Meetup (more in our interview with Pablo Brenner) in the resort city of Punta del Este, where we mingled with IT entrepreneurs and investors. 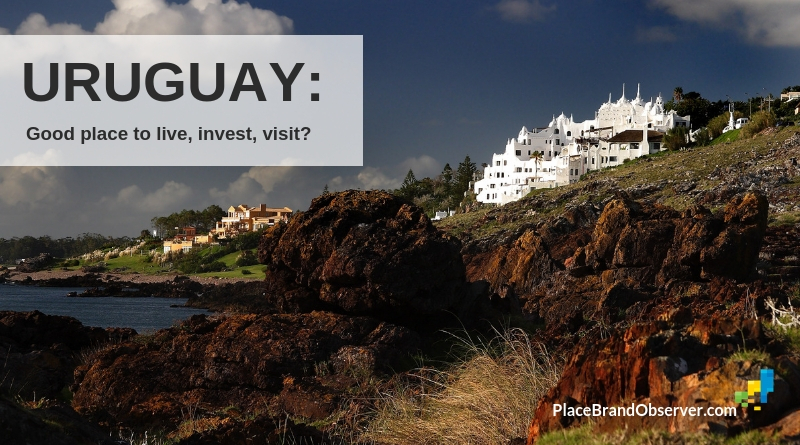 Our impression: there is growing interest among foreign investors to consider Uruguay. On the one hand because of its political and economic stability and high livability scores, and on the other hand because of its generous tax incentives and discounts. We also repeatedly heard references of Uruguay being a friendly country, open to foreigners (probably because most Uruguayans are second or third generation immigrants themselves). How do international rankings and indices assess Uruguay’s performance as economy, democracy and place to live in? Read the summary and overview of rankings in our Uruguay country profile. Environmental sustainability: According to a recent report by Climatescope (BloombergNEF), Uruguay was the leader in 2017 in terms of wind and solar penetration, with 28% of its power coming from those two technologies, putting it well ahead of the U.S. and Japan, and even Germany, which was in second place. As technology prices decline, wind and solar build are rising and producing higher levels of variable generation. Uruguay’s clean energy investment and build booms were fuelled by strong clean energy targets and a series of technology-specific auctions. Between 2013 and 2015, the country attracted almost $3 billion for wind and solar. As of year-end 2017, these technologies together accounted for over 38% of Uruguay’s 4.5GW capacity. But what do Uruguayans think about their country’s potential for investors and talent? Find out in the following interviews – a small sample of the many persons who shared their thoughts with us during our visit. Director of Country Brand at Uruguay XXI. Larissa in this interview illustrates how Uruguay approaches country branding and how perceptions about the Latin American nation have changed over time. Pepi Gonçalvez: Uruguay a good place for film makers? Pepi is the CEO of Motor Films, co-founder of Este Audiovisual and also co-founder of the annual International Jose Ignacio Film Festival. In this interview she tells us why Uruguay is a good place for film makers and feature film productions. What does the Uruguayan government do to attract feature film productions to the country? We asked Martín Papich, Director of the Uruguayan Film and Audiovisual Institute (ICAU). Here his answers. Dr Jorge Silveira Noble is managing director of LATU, Uruguay’s highest authority for quality assurance and measurements and also active in supporting start-ups especially in the tech sector. In the interview he shares some of the success stories that have emerged from the incubator, and gives tips where to look for help and funding. Serial investor and co-founder of Puntatech Meetup, Pablo Brenner has been involved in Uruguay’s start-up scene for many years. In the interview he tells us about his experience as entrepreneur and angel investor, as well as the trends and challenges affecting Uruguay as start-up nation. Martín Larre: Uruguay a good place for investors? Is Uruguay a good place for investors? We caught up with Martín Larre of Sinergia UY. A serial entrepreneur with roots in Argentina, in this interview he tells us why he chose Montevideo over Buenos Aires and what makes Uruguay special for him, as place to live and work. Uruguay’s Vice Minister of Tourism reflects on how tourism has grown in the country and what sets it apart within the South America region. A leading change maker focused on circular economy and sustainability, Giselle Della Mea shares her thoughts on Uruguay’s environmental performance: its strengths and challenges. With thanks to Uruguay XXI for facilitating our country visit. You’d like us to write about how your city, region, destination or country is progressing and working towards attracting investors, talent or visitors? Get in touch here.